This trip was the completion of the length-of-Arizona trip planned last year. There were a few changes to the route originally planned, and we traveled from south to north to take advantage of higher-to-lower elevation differences, as well as prevailing wind directions. We also planned it for a cooler time of year, to avoid the high temperatures that ended the earlier Arizona trip. In a way, this trip was not as exciting for me, since there is no particularly interesting scenery on the route. Still, it was necessary to complete my goal of cycling a contiguous route from Canada to Mexico. And as it turned out, the scenery had its own special charm, even though it wasn't particularly out-of-the-ordinary. When I planned the trip, I kept looking at the 10-day weather forecasts for Nogales, and it appeared this was going to be easy, since nothing but warm, pleasant weather appeared in the forecasts. Yet, as the appointed days for cycling got closer, all four days had rain forecast. In the end, we had to postpone the trip for two days to accommodate the worst snowstorm of the year in the Flagstaff area, with rain and wind in the south. 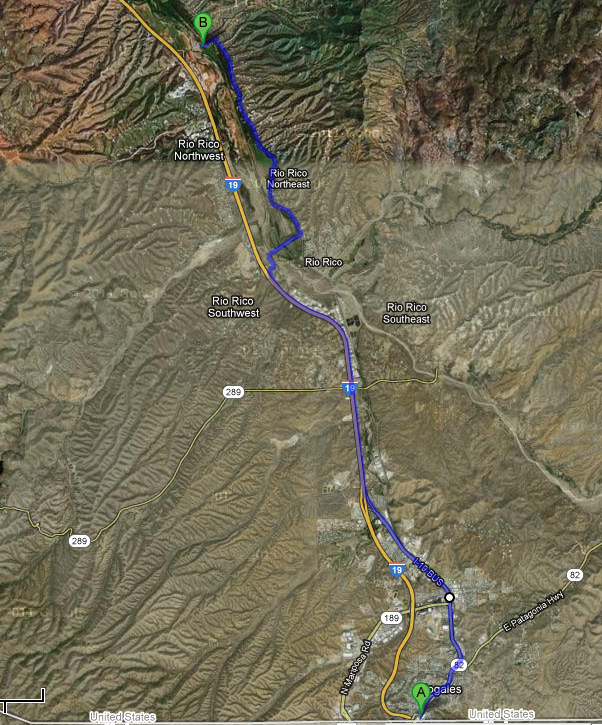 Even with the postponement, the trip getting to Nogales (and the Mexico border) was somewhat harrowing. We planned to pick up our son Laron in Grand Canyon (south rim) where he works, but when we got to the gate, they closed the road, and we had to go back to Highway 89, thence to Flagstaff, without Laron. There was 17 inches of snow in Flagstaff. It was the biggest storm of the year. Fortunately, the road from Grand Canyon opened at mid-morning, and Laron was able to take the Canyon Shuttle to Flagstaff, where he joined us as part of the transport crew, and we resumed our journey. With the postponement, we encountered no rain for any of the cycling, but we had headwinds for the first two days, going into the 3rd day as well. In cycling this, I found that a headwind is more significant than a gentle slope. The headwinds slowed our progress significantly the first two days. 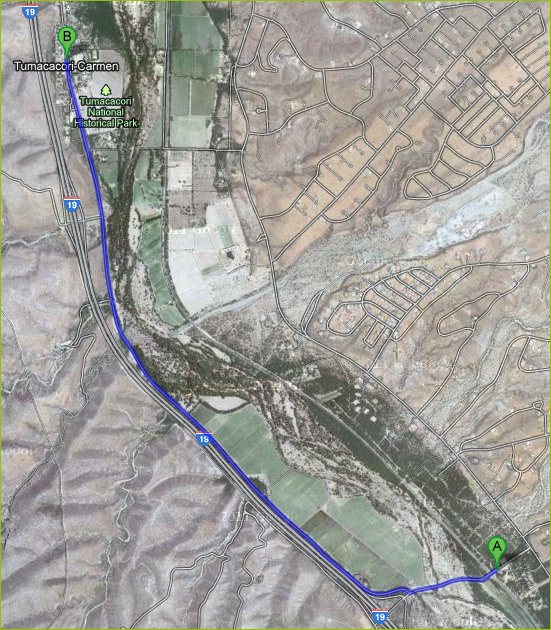 The route itself was complicated, due to following freeway frontage roads, which sometimes ended on one side (but not the other), and sometimes ended entirely. There was one section where there were no frontage roads (or any other local roads) where we had to cycle the freeway. In one case, the map showed no frontage road on the east side of the freeway, but it actually was there, and went through all the way. The route is somewhat complicated at first, and the maps don't cover much territory. 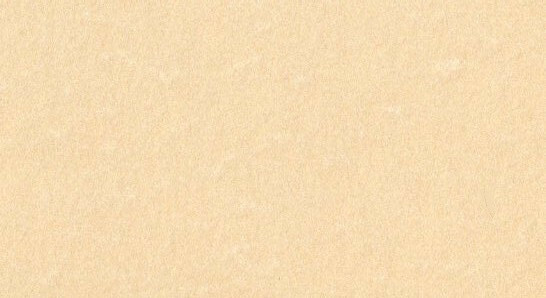 Later they're simpler, and more territory is covered. We traveled north on the pre-freeway main roads for some distance, then ventured east across the Santa Cruz River (at the suggestion of Google Maps bicycling-directions), following Pendleton Drive. This seemed a good choice as the miles ticked by, until we discovered that the road to return to the freeway was a dirt road, and that there was no bridge over the river! Nevertheless, we forded the river, and made it through, following the freeway frontage roads northwards. We stayed this very cold night at the Amado Inn, then continued following the frontage roads to Green Valley, and the old South Nogales Highway into Tucson, which became 6th Avenue South. We followed 6th Avenue through much of Tucson, finally going west on Speedway Boulevard to Main Street, which became Oracle Road, where we stayed the night (in north Tucson), in a motel just north of Speedway Boulevard. The next morning, we went north to Wetmore Road, turning west past I-19 and over the Santa Cruz River, to North Silverbell Road, which paralleled the freeway on the west side of the Santa Cruz River. We followed this road until it began to veer to the west, where we turned east, to go north on a frontage road going north on the east side of the freeway. 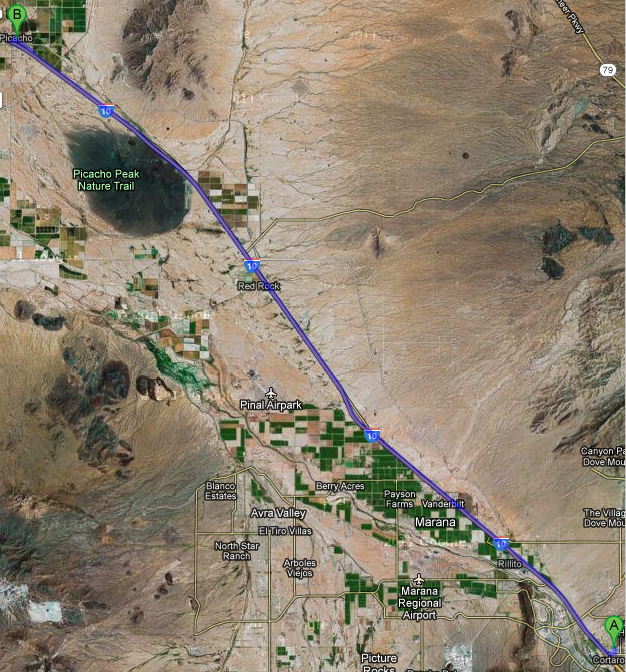 From here, the map covers a lot more territory, since we were able to use the frontage road all the way to Picacho. 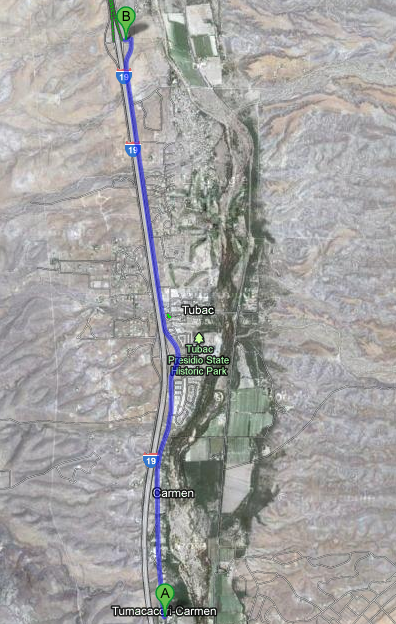 There is a one-way frontage road on each side of the freeway. The east frontage road goes north. At Picacho, there was a KOA campground, where we stayed the night. 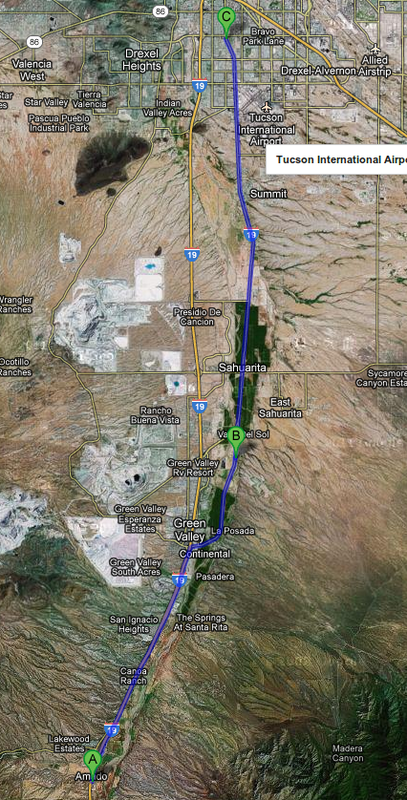 From there, we went north on Highway 87 to Coolidge, then west, and northwest, toward Chandler. 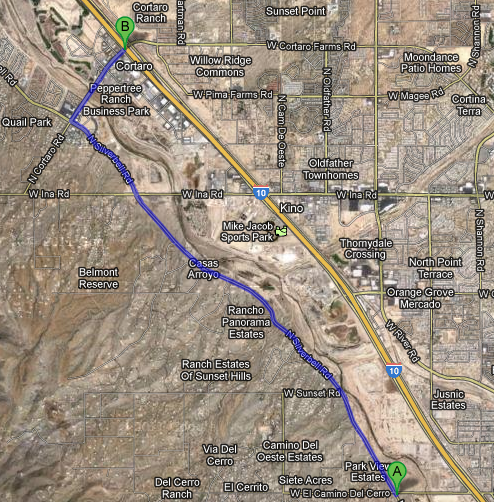 We entered Chandler using Gilbert Road, which we followed through Chandler, Gilbert, and finally to Mesa. 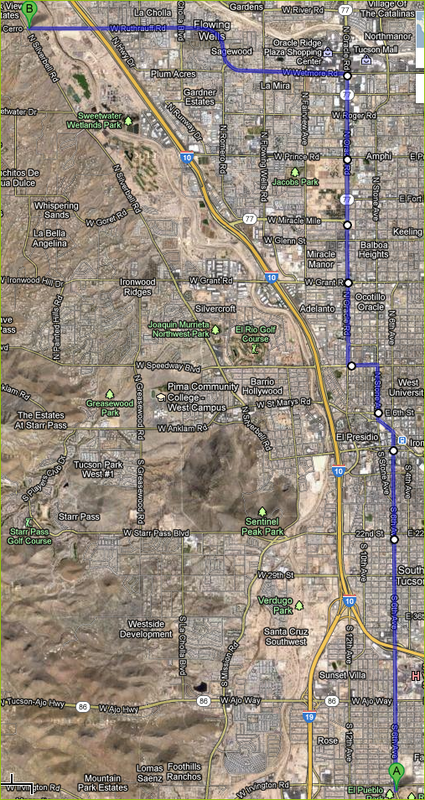 At Main Street & Gilbert Road in Mesa, we completed our contiguous cycling route, and also the trip. Check out the links in the pane to the right of the maps for the details of each day.